So, now that I'm broke, I have to drink harder, cheaper liquor in order to maintain my accustomed-to quality of life. To maintain quality, I decided that my liver needed to take a trip down to Sierra Leone. 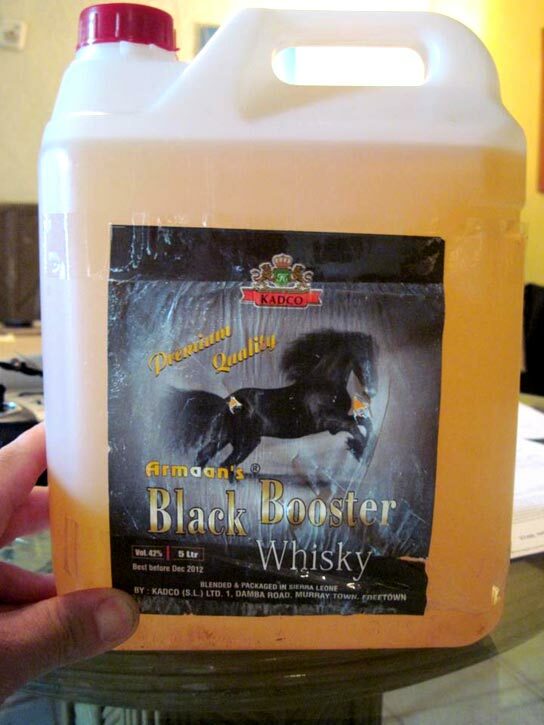 A country with a proud history of quality-whisky has given to the world: Black Booster Whisky, a 5 liter jug that cost two euros and seventy cents. That's right!... cheaper than bottled water. I contacted a representative of Kadco before I mustered up the courage to try Black Booster, but I had difficulty understanding his English. Nonetheless, he informed me that Black Booster is "safe for human consumption." That was all I needed to remember at 7am, while reminiscing about my time in Spain. In Spanish, horse-racing tracks are known as "hipódromo." The fascist government which is currently occupying the seat of power in Spain has relegated the once-wild botellones in Granada to a single area behind a department store. This designated area is known as "botellódromo." A fancy drink that's made in Sierra Leone is perfect not only for the hipódromo, but also the botellódromo, and the drink has the logo to prove it. Kadco's fancy jug of whisky is made with care and consideration: the handle makes it the perfect drink to conveniently carry in a large crowd. Bottles are awkward to hold, but this jug does away with that awkwardness, and the fact that it looks and smells like gasoline make for the perfect icebreaker. Anyway, I took a sip of Black Booster and can confirm that it was not more undelicious than grain alcohol. I spiked it with some fancy juice and sat on the balcony to enjoy the sunrise. I'm extremely impressed with Black Booster and think that it needs to be discovered by adventurous Europeans. Rating: A+++, would get hammered for a few days to Black Booster again.